In a city of star bartenders, how do we choose one to be New Orleans’ bartender of the year? The New Orleans bar scene is full of bartending and mixology celebrities: Jeff “Beachbum” Berry, the industry’s preeminent Tiki expert; Paul Gustings, who has worked for decades behind some of the French Quarter’s best-known bars; or Abigail Gullo, who moved here from NYC and made her mark with her tremendous cocktail programs at SoBou and Compére Lapin. There’s also pre-Prohibition cocktail master Chris McMillian, who now has his own place, Revel Cafe and Bar; Kimberly Patton-Bragg, the tough redhead with a soft spot for bourbon and tequila, who just opened a new location of Three Muses Uptown on Maple St; the team of Neal Bodenheimer, Kirk Estopinal, and Nick Detrich who created the groundbreaking modern cocktail bar Cure and the “proto-Tiki” delights of Cane & Table; or T. Cole Newton, the wunderkind who built a bar that would pave the way for the casual craft cocktail movement in this city. There are so many more world-class bartenders that could go on that list. And they’ve all been recognized time and again by local, national, and international press. The decision for bartender of the year was made using three criteria: 1) taking a cocktail trend in the city and making it his or her own; 2) someone who has previously not received much press and/or acclaim; and 3) being a general badass with both cocktail and hospitality skills. This still led to several contenders, but the instant popularity and New Orleans zeitgeist of Turkey and the Wolf -- a sandwich shop-meets-high-quality stoner-food joint -- made the case that the super-casual craft cocktail scene is here to stay. 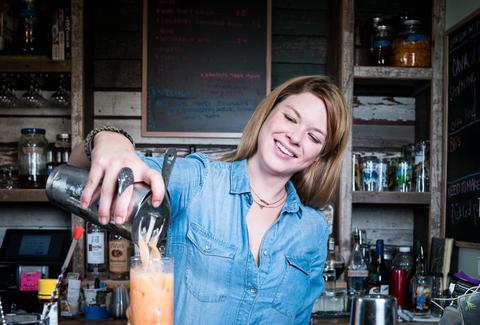 The woman behind the bar at Turkey and the Wolf, who makes seriously excellent cocktails without (God forbid) taking herself seriously at all, the lady that personifies the intersection of fun, food, and hooch, New Orleans’ bartender of the year… Lauren Holton. Every cocktail created at Turkey and the Wolf has to have a name with a story behind it. The unusual names, like Ma’am, Don’t Be Hysterical, or Fred’s in the Well, pretty much guarantee a conversation between bartender and guest. That result, along with paying homage to the wit and wisdom of her now-deceased mother, is the reason that Lauren encourages her staff to have fun and create memorable drinks that lead to memorable interactions. The casual craft cocktail trend has been picking up steam since Cole Newton opened Twelve Mile Limit, a high-level cocktail bar where the vast majority of drinks were $6-7 and cheaper during happy hour. That trend continued in the Freret St corridor, where alcohol permit laws were relaxed to bring more restaurants and customers to the not-yet-revitalized area. Company Burger, Midway Pizza, Ancora, Wayfare, and High Hat Cafe are all super-casual restaurants with great -- and cheap -- cocktails on offer. Seven bucks gets you a rye mint julep at Company Burger, and Ancora has Italian takes on classic cocktails for $9. It was the High Hat, on that same Uptown stretch, where Lauren first flexed her creative muscle in 2011 under the tutelage of manager Ryan Iriarte. When Lauren left High Hat to take a road trip around the country in preparation for opening Turkey and the Wolf, she didn’t take any of the recipes she created -- like the Ruby Hendrick's, a gin, ginger, and grapefruit concoction, or her Three Ladies margarita. 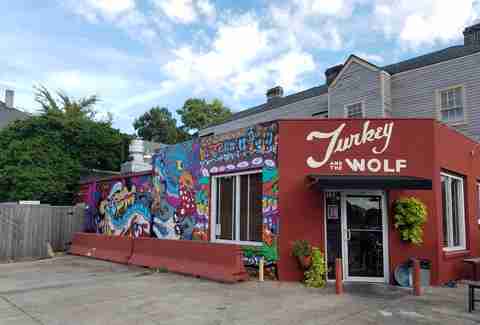 Instead, she opted to start from scratch at Turkey and the Wolf. 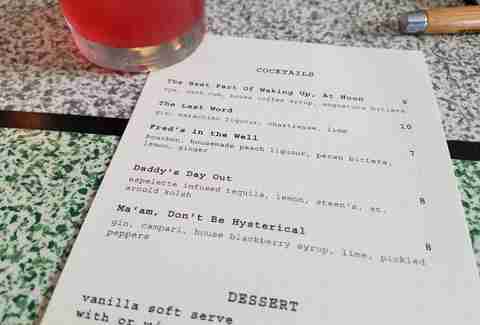 In doing so, Lauren has created one of the most unusual yet approachable cocktail menus in the city. Take the Ma’am, Don’t Be Hysterical, for example. The drink itself seems standard enough to start with: gin, Campari, house-made blackberry syrup, lime, and… pickled Hatch peppers? “Normally after I create a cocktail I make all the chefs try it, and ask them, what do you think would taste good in this? And they said pickled Hatch peppers, and it worked out wonderfully,” she said. The genuine desire to create a space that brings people joy is apparent with every aspect of the restaurant and bar. The philosophy is starting to pick up some steam with the casual cocktail influence. Another trend in the New Orleans cocktail scene that encourages Lauren is the proliferation of more women behind the bar. All of Turkey and the Wolf’s bartenders are “badass women” -- Bazil Zerinsky (adding another gig to her already full plate, which includes El Libre and the Catahoula Hotel), Cassandra Montano, and Kate Mirante are each at the helm. “I’m meeting more and more female bartenders. Before, I just didn’t have that much experience working with other female mixologists. So it’s been really fun and really exciting to get to know more of these up-and-coming women,” Lauren said. The future is a mystery to Lauren, although she hopes to open an additional, more bar-focused operation at some point. For now, though, she’s happy to work and play and create with food and drinks and her co-workers. Turkey and the Wolf will soon have special cocktail and random food pairings on certain nights, like a flight of chips & dips and a flight of cocktails. “There are no rules. I like to think of this being like a big kid’s area. We have bouncy balls. We order a ton of slap bracelets that we go around and slap on people. I want people to feel like they’re a kid again when they come in here,” Lauren said. 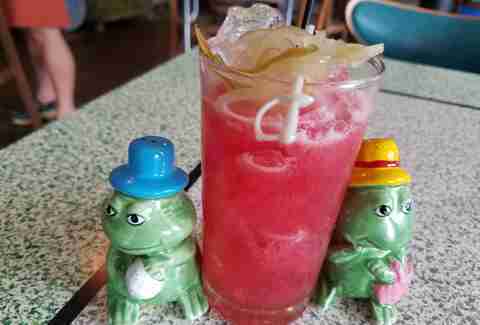 Nora McGunnigle writes about booze, food, and everything related to booze and food in New Orleans. Follow her adventures on Instagram (@nolabeerblog) or Twitter (@noradeirdre).